I have no idea where we picked up this 1992 paperback, but my daughter and I love reading this story over and over. An enthusiastic Grover introduces and lists the simple things we can all do to save energy, conserve water, and clean up our environment and the lovable Muppet crew clearly demonstrates each in lively illustrations. Things like turning off the water while brushing your teeth, closing the refrigerator door so we don’t waste energy, and cleaning up our parks and gathering recyclables up are all things kids and adults can practice doing consistently. There are reminders about turning off lights, tvs, and using cold vs. hot water when possible to conserve energy. At the beginning, Grover explains in simple terms why we should care for the earth and at the end, Grover reviews the list of things all of us are capable of doing or doing better. 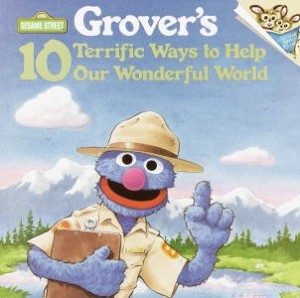 Although I wish they also mentioned eating vegetarian as an easy way to help our world, you can’t go wrong with compassionate Grover and the educational Sesame Street gang. Just picked this up at the dollar spot at Target and love it. My daughter (age 2.5) received it for Christmas and has read it many times. I find it so useful when reminding her to do things – like turn off the light or not to waste water – to just say “remember what Grover said?” The number 1 item is to respect all living things and I use this as a place to say that this is why we don’t eat animals so the vegetarian message does fit in here a bit.